Need help with Coton de Tulear names? Cotton dah what? That’s the reaction I often receive when I tell someone that my dog is a Coton de Tulear. If you’re a Coton dog owner you’ve probably received the same reaction at one time or another. The most widely accepted Coton de Tulear pronunciation is “Co tawn day too lee are” and they are often called Coton Dogs (or Cotton Dogs) because of their unique coat that feels just like cotton. The Coton part of their name is french for cotton and Tulear was derived from their city of origination - Tulear in Madagascar. 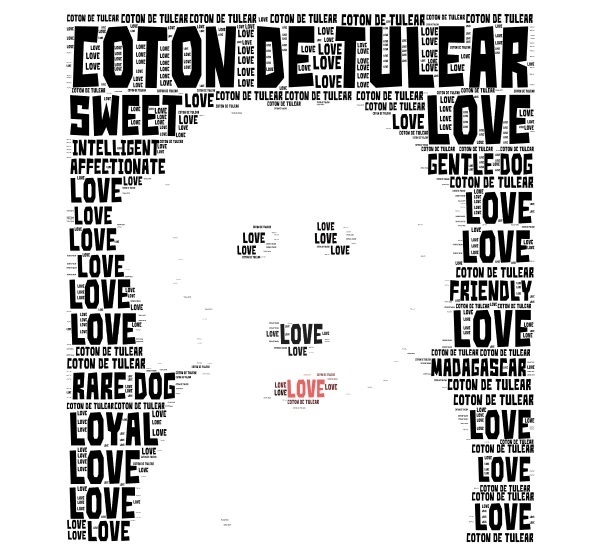 I have also seen numerous misspellings such as Cotton de Tulear, Coton du Tulear, Coton de Tuleer, Coton di Tulear. Your puppy doesn’t care how you say it or how you spell it, since all they’ll hear is the name you give it and the tone of your voice. Don't get bogged down in the pronunciation or spelling of the breed; it's more important to find the best name to fit your dog. Naming your puppy can be difficult since there are so many good dog names to choose from. Sometimes the personality of the dog will dictate their name and other times it can be helpful to use their traits or characteristics to help name them. For instance, when looking for Coton de Tulear names it might be helpful to think of names that would be appropriate for dogs that are white, small, French, happy, mischievous, or smart. Whether you're looking for girl puppy names or masculine dog names, it can be fun to match the personality of your puppy with his or her name. But there are no rules, so find a name that you like and that suits your dog. Here are some suggestions for the best dog names to help make your decision easier. Or you can tell us some of your favorite Coton de Tulear names by using the forms on any of the below pages.